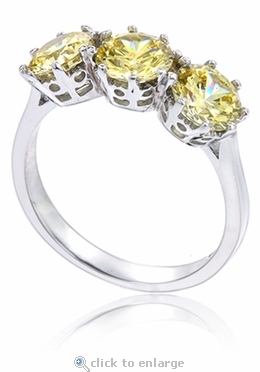 The Roslyn .75 Carat Each Three Stone Round Canary Cubic Zirconia Anniversary Ring features three, individually hand set, .75 carat 6mm round cubic zirconia in a basket setting. 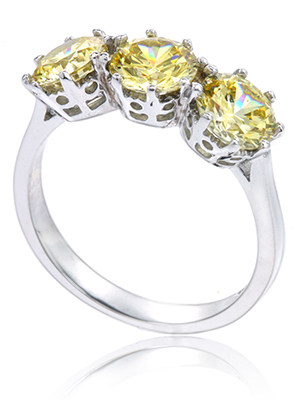 This three stone vivid canary yellow diamond look cz anniversary ring has a beautifully detailed basket setting that gives it an antique estate style look with a vintage flair. 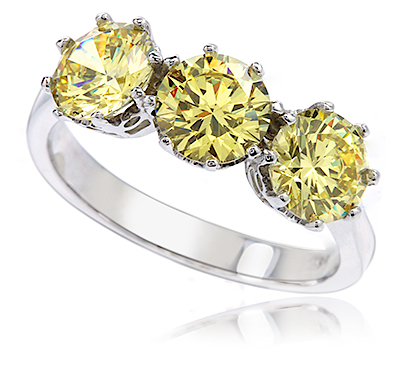 The canary yellow cubic zirconia stones are also available in ruby look, sapphire look, green emerald and white diamond look colors via special order. This three stone round anniversary ring can be worn on the right or left hand, as a wedding band or worn alone as well as with a complimentary solitaire. It includes approximately 2.25 carats in total carat weight of the finest hand cut and hand polished original diamond quality Russian formula cubic zirconia with a shank that measures approximately 2.50 mm in width.